The UAE's embassy in Geneva has advised Emirati woman not to wear Burka in line with a new law banning the face veil in some Swiss regions. In a statement posted on its Twitter page, the embassy asked Emirati woman to comply with that law, which was enforced in July in the Italian-speaking Ticino canton. "Emirati women travelling to Switzerland should avoid wearing Burka (face veil) in that canton…the areas which enforce this ban in the canton include Lugano, Locarno, Magadino, Bellinzona, Ascona and Mendrisio," the embassy said. "We advise all to adhere to the laws and regulations in Switzerland. You should also avoid sitting in a crowded restaurant or café, and putting coats or baggage on the seat in such places. You should also stay close to your baggage in all public places." 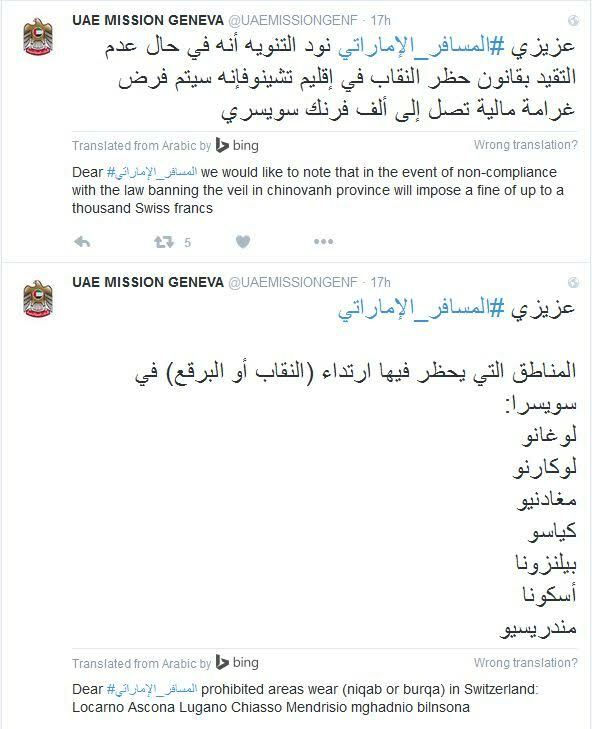 The UAE Mission to Geneva also requested citizens travelling to Switzerland to avoid any traffic violation. And if they violate any rules they should pay the fines before leaving the country. While driving in Switzerland, citizens should be aware of the traffic rules and regulations and stick to the speed limit. It is also advisable to familiarise with the parking laws. The Mission has requested visitors not to carry large sum of money in hand luggage while travelling.